Nature Lodge Sepilok had not long opened when we visited in July 2016. Needless to say it was spotless, but also offered the best value dorms in Sepilok, as well as good value doubles. Nature Lodge Sepilok may not be as close to the attractions in Sepilok as some other hotels and guesthouses, but at an easy 1.2 kilometre walk from Sepilok Orangutang Rehabilitation Centre, and only 250 metres from the fabulous Rainforest Discovery Centre, the location is nothing to complain about. Operated by Nasalis Larvartus Tours, who run Nature Lodge Kinabatangan, it makes connections easy if you plan on visiting the Kinabatangan River. Set back from the road, the eight-bed air-con dorms occupy an L-shaped building. Dorms are mixed, but staff will segregate sexes if numbers work (which is good if you happen to be the only person of that gender at the time — you’ll get your own room). Dorms are spacious with polished wood floors and sturdy wooden bunks, but lockers are not available — take a lock for your bag. Air-con is efficient and windows open to let in some air during the day. They could use a couple of more power outlets, so take a double adapter to share. Bathrooms are segregated and plentiful, but tiny. Hot-water showers and toilets share the same cubicle, however toilets are so close to the wall your knees knock (handy hint: there are some wider ones). Shady verandas outside the dorms offer benches to chill, and the balustrade’s perfect for airing wet jungle clothes. For more comfortable relaxing, a handful of comfy couches deck the open reception building. Opposite the dorm building, a row of duplex chalets offer space and comfort. They are tastefully decorated, with the same polished wood floor treatment as the dorms, plus stylish neutral tones and comfy beds. Hot-water ensuites are clean and smart and lead to a mini private garden. Only one chair graces the veranda, so if there are two of you, be quick. Free WiFi is available, and a very basic breakfast is included though you’ll want something else unless instant coffee and white bread does it for you. Excellent, friendly and helpful staff are full of local information, and will remember your name. Nature Lodge Sepilok is the best budget choice at Sepilok, and for midrange travellers a pretty good deal too. The only negative is that the restaurant wasn’t operating in the evenings when we visited, which meant a bit of a walk in the dark to find food. There are however a couple of good eating options around, and a local shop next door sells cold beer. 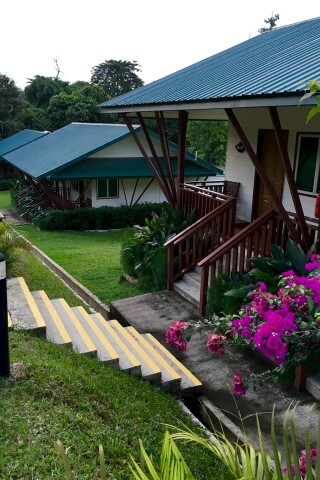 If you’d like a few more facilities with your dorm bed, Sepilok Forest Edge Resort offer pricier but excellent dorms, along with a tiny pool and superb restaurant.